The functional properties of many metals and alloys are determined by the chemical and/or morphological distribution of the crystallographic grains in the material. The properties of the regions where grains come together (grain boundaries) often determine the formation, evolution, and stabilization (or dissolution) of the grains and as such, characterization of grain boundaries (GB) is of critical importance in materials studies. Although focused ion beam (FIB) methods have previously been employed to prepare samples for atom probe tomography from materials containing grain boundaries, standard FIB sharpening methods have been combined with a FIB lift-out methodology. A wedge of material containing a grain boundary is removed from the sample such that the grain boundary is running along the long side of the wedge. It is clearly visible from a side view (denoted by arrows in the top left image) Small pieces of the wedge are attached to multiple tips on microtip coupon™ carriers. Multiple specimens containing the same GB may be fabricated in this fashion, each being sharpened to the required final radius using annular FIB milling. Example carbon atom maps from two different analyses of the steel are displayed on the top right image. Only the positions of carbon atoms are shown, remaining atoms are removed for clarity. 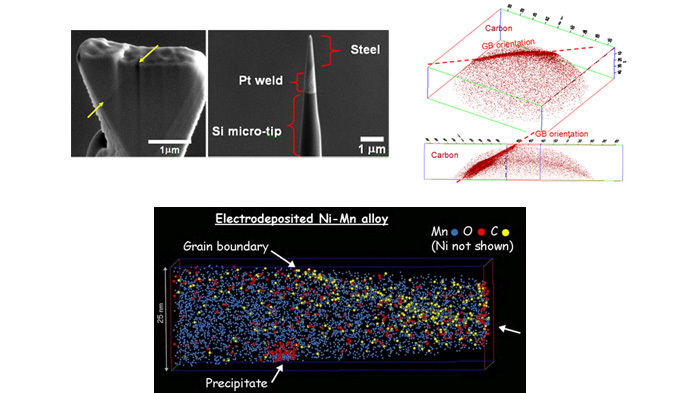 Mn addition significantly improves the thermal stability of electrodeposited Ni films both by segregating to grain boundaries and forming second-phase particles that impede grain boundary mobility. The below image shows the 3D reconstruction from an electrodeposited Ni-Mn alloy annealed at 600°C for 1 hour, revealing C segregation at a grain boundary and the presence of a Mn-rich precipitate. Data by courtesy of Dr Emmanuelle Marquis, acquired on LEAP Atom Probe at Sandia National Laboratories.